Collection of TOP Magazine WordPress Themes for creating professional newspaper or blog webpages with trendy 2018 look. Time to start publishing! Nexus is PRO magazine wordpress theme by elegantthemes! It’s full of custom models and widgets which help you to setup your page quickly. Nexus is clean template with organized layout which gives your visitors smooth reading experience. Nexus runs on secured and valid code which is W3C optimized. It’s fully responsive and compatible with major internet browsers. You can easily build your layout with homepage builder which allows you to drag and drop different website modules. It comes with unlimited colors, complete localization, custom widgets and built-in advertisement areas which you can manage through epanel. Elegant Themes club has been producting amazing wordpress themes for ages and they’ve been offering high quality support as well. Their competitive pricing and quality makes them one the the best on the market! Don’t hesitate and join their wordpress club. Good Day News or simply GDN is magazine theme that is far ahead in terms of design, creativity and versatility. If you are running a magazine or newspaper, this theme has been created for you and can be the right web design inspiration. Even, if you have a personal blog it will suit your needs. GND will impress visitors straight away in first few moments and make your readers come back over and over again. Theme comes with many modern and stunning home-page layouts which can be imported in few clicks. Available are men’s miral magazine, business, video, lifestyle, fashion mag, tech & entertainment blog, movie news, world journal, travel and food blog theme versions. Each prepared layout is fresh-faced and unique. Template has many great features, such as responsiveness, ability to change the width of layout as you want, integrated sharing buttons so the world can share great stories, new lazy load system which helps with the loading speed, compatibility with the most popular and useful plugins, support by .po & .mo files so you can translate to whatever language you want and much more. Theme is SEO optimized and fully compatible with Yoast SEO plugin and with the latest WordPress version. The building process is backened by newly redesigned RevoComposer, an easy to use drag & drop page builder. Personalization and customization processes are intuitive and fluid as you can choose from 32 header layouts, 625+ Google fonts, unlimited color combinations and much more. GND magazine theme comes with excellent professional support team and extensive documentation. Waylard is a WordPress theme that is best suited for fashion blogs and portfolio sites. The theme is compatible with the latest WordPress versions. Built with valid, semantic code, it is also SEO-friendly and WMPL-ready. Running on a responsive Bootstrap framework, Waylard can adjust to any screen size and resolution flawlessly. It is licensed under GPL v3.0, which allows you to install the theme on more than 1 web resource, and tweak its code in a variety of ways. For a quicker and more effective layout customization, the theme is pre-loaded with WordPress Live Customizer. The tool lets you tweak multiple layout elements and see the changes live, without waiting for the page reload. The layout is simple and minimalist. Thanks to the smart use of whitespace, visual and written content look more prominent. You can enhance the look of your blog pages by means of the built-in Carousel slider. Facebook Like Box, Instagram Board, and Twitter Feed integration allow your visitors to keep track of the latest updates from your social media profiles right on the site. Also, people can feel the ease of reaching you online due to the integration of various working forms. Make sure you visit live demo in order to experience user interface and get the exact feeling of your future readers / visitors. It will give you exact overview if theme fits for your content and needs! Content will be king for you, I recommend to check out tips for improving your editorial and magazine web design craft. Click Mag magazine is a complete solution for any type of blogger. It suits anyone no matter if you are beginner or advanced author you will be surprised with the modern, remarkably elegant and responsive design. The theme looks great and sharp on retina-ready devices. 30+ available features, including Theia Sticky Sidebar ($18 value), makes Click Mag a powerful medium to craft a shinny and popular blog. Theia Sticky Sidebar allows the important information displayed in the sidebar to be visible while visitor is scrolling the page. Theme suits tablets and hand-held devices very well and it is ready for the best SEO optimization. With WooCommerce compatibility it is possible to turn Click Mag to a selling machine Make your website ad effective. Add as many ad units as you want, adjust them to your needs, place them on the home-page, post-page, simply wherever you want. The included Ad Widget accommodate 300px wide ads in the sidebar. This multitude of ad placing options makes Click Mag an advertising beast. With a purchase of Click Mag you wont get only a remarkable theme but a free lifetime updates, comprehensive documentation and half year support from MVPThemes. If your goal is to deliver great visitor experience, you can’t go wrong with Click Mag. Have a look on live preview of the magazine in order to get better ideas of what you can create out of this WordPress theme. Inkas is one of the best magazine wodpress theme in our collection! 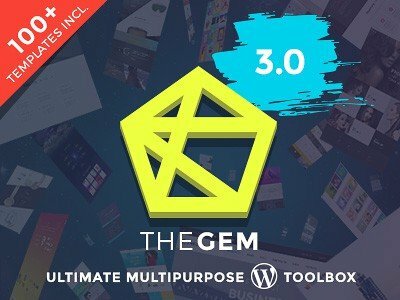 It’s been released by unCommons, one the elite authors on themeforest. It’s best for newspaper, magazine, blog or personal CV card. 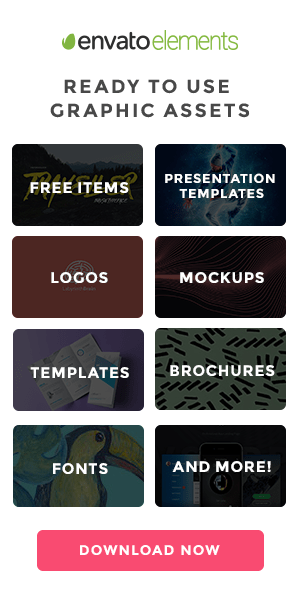 You can take advantage of plenty different pre-designed layouts, such as, 3 headers, 7 blog loops, 5 different sliders and bunch of amazing homepages. Inkas comes with great features, such as, redux based, bootstrap 3 framework, amazing greensock engine, css skins, periscope streaming design, live social streaming design, google fonts, 5 amazing sliders, 2 footers, lightbox, etc. Inkas has a lot to offer and you should definitely check out live demo. It will give you idea about users experience. You can use this template for any type of industry, it super easy to adjust and also very easy to install. Template also comes with support forum access, detailed step by step documentation and regular updates. Feel free to contact unCommons team with any pre-sale questions. Are you ready to get your personal magazine ready in few hours? Read some tips on starting your own online magazine! It will give you great ideas and help you to avoid classy mistakes. Professional magazine theme released by teslathemes is for sure great choice for your wordpress website. You can create PRO looking magazine or blog in couple of hours! Get your layout ready as soon as possible and save your effort for content creation. 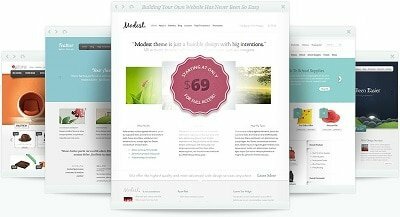 Theme is packed with TOP features, such as, demo data, visual composer, brekaing news feature, sticky popular posts sidebar, print ready articles, child theme option, cross browser optimization etc. Tesla theme guys offer cool things for FREE as well. Visual composer is worth of $34 and comes included for no cost. Another thing is FREE 1 hour customization offer which I haven’t seen anywhere else on internet so far. Theme is also fully responsive and mobile friendly what means you can load your website on any type of internet browsing device or internet browser. Tesla themes is one of the most reputable marketplace out there when it comes to quality wordpress themes. I can guarantee quality of their products, updates or 24/7 customer support. Pricing is very reasonable and affordable for beginner or experience designer. Make sure you visit live demo and go through all features which you newspaper could possibly require in the feature. Himmelen is professional blog / magazine theme with very trendy design and unique layout. It comes with 5 different blog layouts, 2 featured post slider layouts, popular posts display feature and custom widgets and promo blocks. Template scores very well in google speed test and user experience test! It’s great news for SEO and you can be sure that your articles we’ll rank well in search engines. There unlimited homepage variations and you can also choose from couple of pre-designed layouts. It will save you plenty of time, which you can use for writing of new content. To speed up process, you should import demo data after you install template. It’s very easy, it only takes one click to get it done. What else? Himmelen comes also with unlimited menu options, unlimited header options, 2 different homepage sliders, banner in header, logo position variations and unlimited footer widget variations. As you can see it’s pretty packed and you can setup plenty of different features for your magazine or blog. Feel free to jump on live demo and check out how’s the user experience and speed of the website. 15Zine is another professional magazine wordpress template with very modern & clean design. It’s suits all trendy online projects in fashion, travel, retail industry! Template has been very popular and over last 6 months it has powered more than 2000 magazines. 15zine is fully responsive, retina ready and optimized for all major internet browsers. It comes with extended mega menu where you can list all your topics, categories and grow your magazine exponentially and still keep it read-friendly. In mega menu you can also highlight trending post! What else? 15zine comes with super easy to use page builder which is very powerful and allows you to get your layout done within few drag & drops. Template comes with other cool features, such as, review system, advertising spaces, audio post types, font control, trending icons etc. If you are looking for some PRO solution for your newspaper or blog this template we’ll meet all your requirements. Don’t forget to check out live demo and try the user experience before you decide to buy 15zine. I personally used it for one of my magazines and I definitely recommend it! Ink is elegant magazine template which can be use for blog as well. It’s very clean and professional looking theme which will engage your visitors. Supported with 14 premade homepages for all needs: travel, food, fashion, lifestyle, storytelling, you can select to show your content with the WP Personal theme INK. Feel free to check live demos of all version, they are very interesting. With featured slider you can set any of your blog posts to be featured on TOP. There are different styles of slider available. Blog page itself comes with various layout styles as well. You can post also different types of posts, such as, link, video, gallery, audio or standard. Template is suitable for beginners with wordpress because it comes with bunch helpful stuff, such as, online documentation, support forum access and regular updates. All that will save you plenty of time and you can focus on blogging and adding new content. Olsen is very PRO looking wordpress blog theme which can fit any elegant magazine or newspaper website. It’s ideal for lifestyle and fashion magazine the most but you can adjust it to any other topic as well. Olson comes from cssigneter.com marketplace where they offer plenty of theme in their premium membership. Their themes are famous for their speed and score in google developing tools. These facts are essential for SEO and search engines strategy. Olsen also comes with other features, such as, multiply layouts, infinite style variations, post formats, live editor, custom widgets etc. Template comes for very reasonable price and you can get it for only $39. You can also choose from membership packages which are $49 or $79 and they include all the themes from the club. Olsen blog theme comes with regular updates, support, detailed online documentation and tutorials. If you are looking for advanced template for your blog or if you would like to start something more than blog, then Olsen is great choice for your project. Another powerful newspaper wp theme is out on themeforest! In the first week it made 70+ sales and that speaks for everything. It’s packed with tons of features but still looking very simple and organized. Flexmag comes with plenty of pre-designed pages and skins for home page, article page or featured posts. It’s very easy to install, setup and customize. No skills special required! Flexmag comes with premium features ready for your newspaper website, such as, fly-out navigation, scoreboard, 700+ google fonts, mobile-first design, auto loading posts, sticky sidebars, custom widget etc. Template is fully compatible with woocommerce and bbpress what means that you can run eshop on your website as well. You can, for example, divide your magazine in free and premium parts. Flexmag is fully optimized for search engines and your articles will rank very well. It supports all video formats and you can integrate youtube, vimeo and other video channels. Template come with detailed documentation, regular updates and access to support forum where you can get help from developers team. It’s very powerful template and you’ll definitely appreciate all the features while tuning your own newspaper! Observer is one of the most popular magazine wordpress themes on mojothemes marketplace. It’s been featured on popular themes page for more than a year! Observer is truly professional and suitable for any type of online newspaper or blog. It’s fully responsive, browser friendly, HTML5 and CSS3 coded, easy to customize etc. The most popular features are review widget, lightweight, typography, TV page, SEO optimization etc. Observe comes with very reasonable pricing and FREE support, online documentation and regular theme updates. If you would like to try it, feel free to jump on live demo and experience the same thing like your visitors will. It’s definitely one of the best templates for magazine related websites. Fatima is responsive newspaper theme with bunch of amazing features and PRO design. Template is fully responsive and you can use on any type of device and browse via all internet browsers. Fatima is SEO optimized and your your articles & publications will rank in search engines very well. It’s very simple template adjusted only for magazine purposes. It’s ideal for beginners with wordpress who would like to run their newspapers or blog. Another great thing is woocommerce compatibility. With FREE woocommerce plugin you can run your eshop and sell premium parts of your magazine or downloadable versions! Fatima is fully supported, documented and regularly updated. Template’s package comes only for $49 and it’s available on mojothemes marketplace. Feel FREE to check out live demo before you do any decisions about purchase. Gameszone is popular magazine template from themefuse marketplace! It’s been out there for more than a year and it’s one of the most advanced theme in its category. Gameszone is focusing mostly on game industry which is becoming extremely popular nowadays. You can of course adjust the template to any other types of magazines. It comes with bunch of premium features, such as, live color changer, 100% responsivity, advanced admin, 1 click demo content install etc. One of the best things I like about themefuse club that they have their own Testlab area where you can try all their templates for FREE. You just create the account, they install the template for you and then you can try it out. That gives your real experience with template before you buy it! How cool is the right? They also offer online documentation, free lifetime updates and access to support forum. Enjoy! 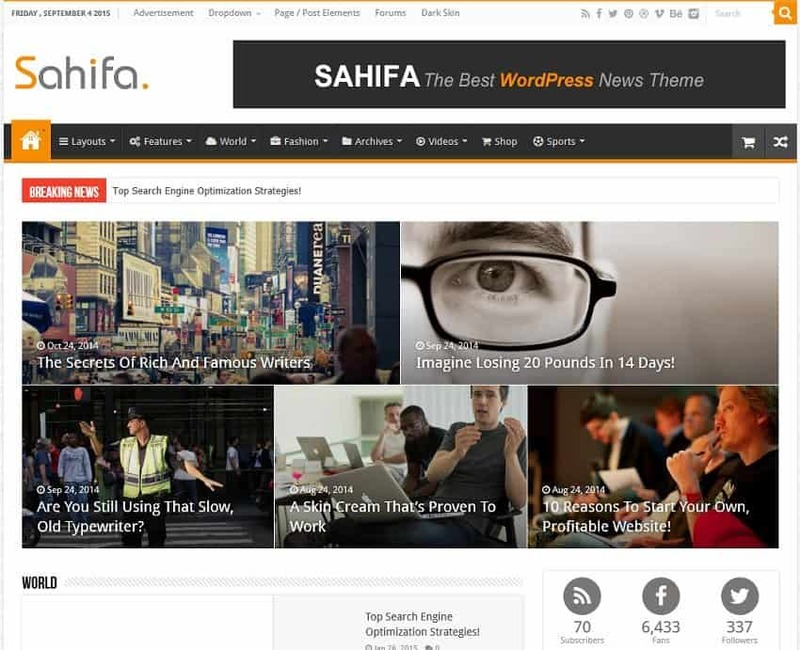 Sahifa is one of the best selling wordpress themes on themeforest! It’s been constantly updated since August 2012 and that’s what makes it so powerful and still very trendy. It has more than 10k+ satisfied users and it’s one of the best rated templates in marketplace. Sahifa is fully responsive and retina ready. Template is fully compatible with bbpress & buddypress plugins. Tiepage builder helps with setting up your layout and you can easily setup everything by draging and droping elements. In case you would like to run an eshop within your magazine website, you can easily install woocommerce plugin which is fully compatible with template. 1 click demo import can save plenty of time by setting up layout and pages from demo versions. Sahifa also comes with bunch of premium plugins for FREE, such as, review plugin, instagramy, iLightbox, sticky sidebar etc. They all will save you $74 with purchase of the template. Template is SEO optimized and comes with fast loading speed as well. Everything you can think while creating your magazine is there! Live demo of template speaks for everything and you should definitely check it out! Newspaper is beautiful and trendy wordpress themes for news website, blog, publishing site or reviews website. It’s fully responsive and compatible with youtube, adsense or adwords. Newspaper is very friendly template and you do not need any high skills to get you news website done! Admin panel is very intuitive and very well documented. In case you can figure something out just contact support team and they help you with any issue. You can take advantage of already pre-designed demos, such as, travel, health & fitness, tech, sport, video, blog, fashion etc. Ads system is very smart and you’ll be able to make good money once you get your traffic. It’s almost impossible to list all the feature since this template is regularly updated and plenty of new ones are being added on monthly bases. Another advantage is that template comes also with PSDs which can be very useful if you need to adjust theme for showcase before you start building it. Check live demo and item detail page and if you think something is missing, write feedback to author of template and you might see it in upcoming update! Newspaper is one of this year best selling wordpress themes! Disclosure: This article contains affiliate links what means that if you click on them and purchase an item (product) or membership package, we may receive commission from the sale. All reviews and descriptions are our own and we do not accept any payments for adding positive reviews.